Bakaiku is a municipality of 340 inhabitants, situated in the geographical area called Mountain of Navarra. Bakaiku is located in the foothills of the Sierra de Urbasa , surrounded by green meadows and dense forests of oak and beech , on northwest of Navarra , in the region of the Barranca ,the Sakana Valley, 44 km from the capital, Pamplona. 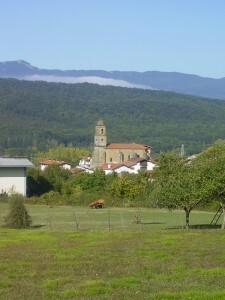 As the valley , the town is located in a natural and strategic corridor between Alava , Navarra and Gipuzcoa. This privileged location gives you an easy and quick access to Pamplona , Vitoria, San Sebastian , Bilbao and Bayonne or even Biarritz. Parochial church of San Juan Bautista : It is a baroque building of the XVIth century, but it’s fundations are from the early Middle Ages , as there are inscriptions of 1216. Hermitage of Santiago : Located in the center of the village. Hermitage of San Benito : It’s located in the bottom of the Barga and is believed to be the only remnant left of a possible settlement that like so many ones in the valley of Burunda, those that disappeared as a result of the Black Plague in 1348 . In its interior mural paintings are conserved. On March 21st, is performed its pilgrimage. Hermitage of Santa Marina : Located in the top of Urbasa mountains as privileged viewpoint of Burunda Valley. Remains of an old forge built in the mid XIXth century. Two traditional sinks that have been preserved in perfect condition.